The move is said to enable artists and songwriters to gain extra revenue from their lyrics. 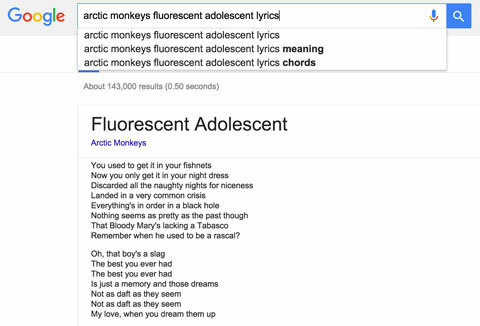 Your home karaoke session is about to get a lot easier, because Google has launched a lyrics search function. According to Billboard, the technology company and general font of all knowledge has signed a multi-year licensing deal with Toronto-based company, LyricFind, to give fans access to the words of their favourite songs. And it looks like most of the lyrics will appear without the need to click through, which means anything from Thom Yorke's warbles to Alex Turner's turns of phrase should be deciphered in no time. We tried using the search function, and it looks like it's already up and running. While we won't be spending a penny on them, according to Chief Executive and co-founder of LyricFind, the search function should provide a "significant revenue stream" for artists and songwriters. He added: "I can’t get into the rates, but we expect it to be millions of dollars generated for publishers and songwriters as a result of this." We doubt the same can be said of current lyric sites, though.